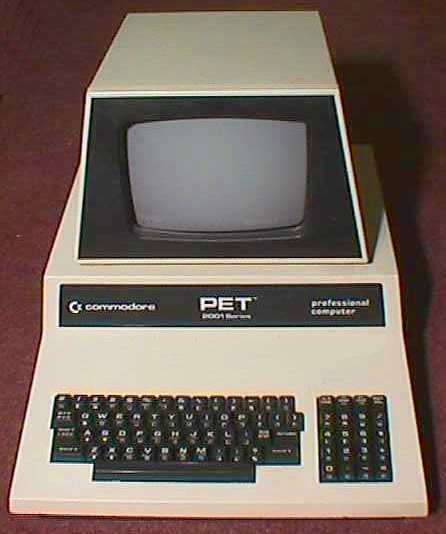 The first computer I ever enjoyed was the Commodore PET. My dad would bring it home from work on weekends in the late 70s and very early 80s. My three favourite games were horse racing, where I'd essentially bet against simulated racetrack odds, lemonade stand, where I'd manage a virtual lemonade stand, and Eat Man, a complete rip-off of Pac Man. Comparing the Commodore PET to today's PCs is a lot of nostalgic fun. We had virtually no graphics to speak of, no colour, no mouse and the storage medium was something we called a Commodore Datassette. That was essentially a dedicated computer tape recorder that looked like a cassette deck. I learned my first programmimg (waterloo basic) on a SUPERPET at College in 1981. Ah tape drives! Our house (aka my Dad) didn't go with a name brand. We had a TRS-80 Model I (Tandy Radio Shack), and then upgraded to a COCO II (Colour Computer). I'm sure the specs and such were comparable except for the fact there was much less software available for our stuff. Though the 5 1/4" floppy we had for the COCO loaded a LOT faster than the discs for a Commodore 64 ever did at my friend's houses. I remember playing lemonade stand and Dam busters in Kindergarten on the Commodore pet (1979/1980). I also remember going to the Michigan Commodore Users Group meetings with my father during the early 1980's.